Alyssa Jones is a student at Point Loma Nazarene University. 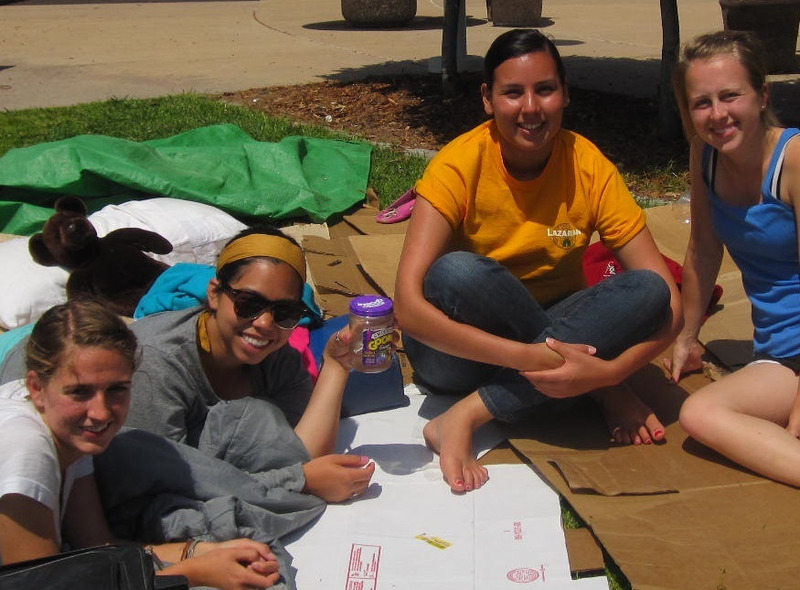 Along with her friends, Alyssa lived on $2/day for 3 days to raise awareness about poverty and raise money for Grameen Foundation. I’ve never done anything like the $2 Challenge before. The experience was amazing, and really changed my perspective on poverty and homelessness. There are so many homeless people in the city of San Diego, and living like them for a few days helped me see them differently. Of course we had luxuries that they may not have, and our experience was over in three days, but I learned a lot regardless. Sleeping outside in a cardboard box isn’t very comfortable, and meals consisting of only beans and rice get very bland after awhile. Not showering for three days and wearing the same clothes, especially during college classes where everyone else is clean and wearing nice clothes is very humbling. The lack of cleanliness was the toughest part, and gave me a lot of insight into the difficulties of poverty. Despite the difficult aspects of the challenge, there were a few good moments. The community feel was my favorite part, as we prepared the meals together, and prayed over our dinner before we ate family-style. There was simplicity to life, as we did everything together and enjoyed a break from technology. Living homeless for three days was hard, but it changed my whole view, and I’m so thankful for that. Read more reflections from another participant at Maira’s blog about her experiences and thankfulness for being able to sleep on a real bed after the challenge is over. PLNU $2 Challenge from Point Loma Nazarene University on Vimeo. This entry was posted on April 28, 2010 at 3:42 pm and is filed under microfinance, Travelogue. You can follow any responses to this entry through the RSS 2.0 feed. You can leave a response, or trackback from your own site. I had heard about this challenge some time ago, but didn’t have it in me to try it out myself. I admire your courage. I encourage eveyone to organize and take part in the $2 Challenge at school and/or work. It’ll be an experience of a life time. I’ve been to places where people survive with less than $2 a day, it’s challenging but possible! It’s a brave action for you to do the challege…not only because you wanted to experience it but I guess you did really prepare yourself mentally and emotionally knowing you’ll only have $2/day….Great job! 2# (dolars) in a day,what a gud policy dat wil bfit us in Nigeria atleast it wil minimize excesiv spending and reduce poverty.gud chalange and kudos 2 her.